Matching look. You’re likely to have matching handles, knobs, etc. The “brush” on the stainless steel will be the same from one appliance to another. The displays will have matching color of lighting and text. It’s nice to have the appliances look like they belong together. Warranty and service. Basic warranties are likely to be the same from one appliance to another within the brand. It’s a small thing, but nice to know that all your appliance have a X-year warranty on parts and labor. Similarly, it’s nice to be able to make one call to one number for all your appliance service needs. Manufacturer incentives. It is very common these days for appliance manufacturers to offer savings, sometimes even FREE appliances if you buy a suite or collection of appliances of the same brand or manufacturer. You can select the brands that have the best performance or quality in each product category. Get the brand A refrigerator that you’ve always dreamed of, and the famous German brand dishwasher that you’ve heard is so great. Save money by shopping for the best brand or model in each appliance category. It might even be less expensive purchasing different brands than getting a rebate or “free” appliance if you purchase a single brand. While these are the fundamental arguments that you need to consider when purchasing new appliances there is another consideration that I’d like to share. I’ve been noticing that appliances can be used to create interest or as focal points in a kitchen. 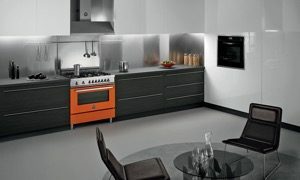 For example, here is a range (below) that is definitely going to make a striking difference in your kitchen. it makes little difference that it doesn’t match or isn’t your preferred brand. It makes a boring kitchen POP, and takes a monochromatic kitchen to an entirely new level. The revelation for me was that I was boxing myself in by looking at only single brand vs best of breed kitchen appliances. It’s good to have guidelines, but it’s also good to be open-minded. 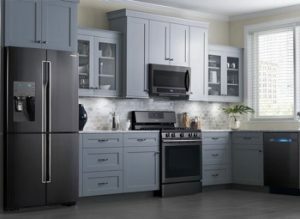 To find the best appliances for YOUR new kitchen be sure to contact the experts at Arizona Wholesale.